[one_half]Australian Gold Sinfully Black Bronzing Lotion 15x gives you the deepest, darkest tan imaginable. The formula has a blend of powerful bronzers that heighten the effects of ultraviolet light and spur the skin cells to accelerate their production of melanin. Then, additional bronzers go into action, perfecting, deepening and enhancing the color until it reaches that ultimate dark color that you’ve been looking for. This bronzer has a 15 times power bronzing infused with caramel, walnut, and monoi de Tahiti extracts. It contains hemp seed oil, kukui nut, and sunflower oil to give you a deep, dark tan while retaining moisture. Australian Gold Sinfully Black comes in an 8.5 oz bottle with pretty white scrolling and of course the cute koala bear with a surfboard. I like the scent berry scent of this lotion although I still love the original scent of most of their other products more. It’s a fairly inexpensive lotion compared to many others but you’ll definitely get a better deal online rather than buying it through a salon. Make sure to buy from a reputable online supplier so you know you’re getting the real thing. The lotion has a thin consistency so if you like a thick consistency you may not like this one. I don’t mind the consistency because it goes on quick and absorbs easily. It comes out thin but provides really good coverage. Be warned that due to the thin consistency, you may have to purchase more often because it may not last as long as a thicker lotion. With that said, it’s worth it because it really is a great lotion. I cannot say enough about Australian Gold, all of their products are fabulous and I’ve used just about all of them. They are known for their great quality in tanning lotions and bronzers. The thing I love about this lotion is that it leaves your skin super soft not only after you apply it, but long afterward. This bronzer brings out a beautiful tan within a short time. I used it at my tanning salon and noticed the difference after one session and no burning. To keep my tan looking great without fading I use it twice a week. This lotion does not stain, at least I haven’t seen any staining when I’ve used it. No streaking marks either. This is also a great product for fair-skinned people and it won’t leave you with a fake looking tan. It works just as well used outside but I recommend using it for a very short period of time outdoors as it does not contain any sunscreen. Just be sure not to use it on its own for a long period of time outdoors it does not contain any SPF and you will burn. I normally use this lotion in conjunction with one of Australian Gold’s other sunscreen products which are also great! I absolutely love the look and feel of my skin after using this product. It absolutely leaves your skin silky smooth to the touch and not greasy at all. I love Australian Gold Sinfully Black 15x. 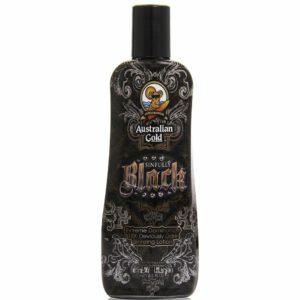 I highly recommend Australian Gold Sinfully Black to anyone who is looking to get a great tan and at the same time have smooth, healthy looking skin! Australian Gold products are cruelty-free, and not testing on animals make them even more amazing.